Welcome to Tampa Bay Golf & Tennis Club, one of the finest active adult communities in the Tampa Bay area! 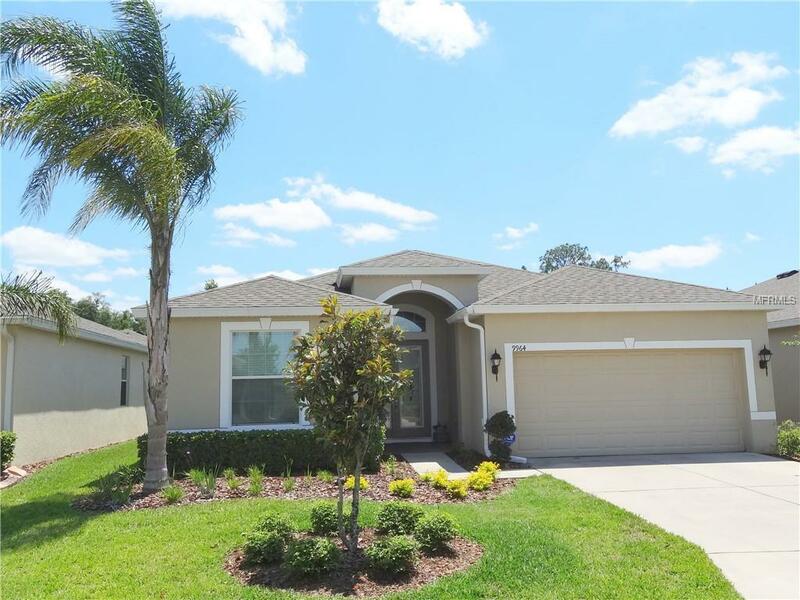 Prepare yourself to be awed by this 1,707 square foot 3 bedroom, 2 bath home just 4 years new with a wide-open split floor plan featuring 18 inch tile on the diagonal virtually throughout. Upon entering through the leaded glass front door and brick paver outside foyer, you pass by 2 bedrooms, a full bath and laundry room before entering the expansive dining room, great room, kitchen and adjoining casual dining area all connected to one another. The kitchen features 42 in. Espresso cabinets with double crown molding, granite countertops, s/s appliances, pedant lighting, island with breakfast bar and walk-in pantry. Other attributes include a rear screened-in covered lanai with brick pavers, security system, water softener, gutters & downspouts, all window treatments, all appliances, tray ceiling in the master bedroom, and granite countertops in both bathrooms. The $80 monthly maintenance fee also includes basic cable TV. Come see where Tampas active adults are having fun playing golf, tennis, shuffleboard, billiards, lounging by the pool, attending live shows, or immersed in card games, you wont run out of things to do at the manned, gated Tampa Bay Golf & CC! Just one minute from I-75 and 10 minutes from the immensely popular shopping and entertainment district of Wesley Chapel. Make your appointment today! Additional Lease Restrictions Verify With Hoa For Lease Requirements & Approval. Amenities Additional Fees Golf Course. Pet Restrictions Verify With Hoa For Restrictions.